By the late 1800s, European Jews began to immigrate to Palestine. The Western culture that they brought with them mixed with that of the native Muslims and Christians, producing the unique and diverse culture that exists today. During the 20th century, artists strove to create a distinctly ‘Israeli’ style of art. Though still influenced by their European and American contemporaries, Israeli artists aimed to create something completely new. Reuven Rubin was born in Romania and moved to Ottoman Palestine in 1912 to attend the famed Bezalel Academy of Art and Design. One of the founders of the Eretz Yisrael Style of the 1920s, he followed in the footsteps of European artists of the previous decades such as Paul Cézanne and Henri Rosseau, and went against the classical teachings of the academy. Rubin wanted to paint the landscapes and local people of Palestine, that to him were so different from the cold, grey Europe from which he came. His paintings depict the older land of Palestine, in a naïve and colorful manner. Rubin’s bold ideas and art truly paved the way for countless Israeli artists to come. One of the most influential female artists of Israel, Anna Ticho was originally from Moravia, then part of the Austro- Hungarian Empire; and moved to Ottoman Palestine in 1912. She originally worked as a nurse, and during a recovery from a bout of typhus she began to sketch and draw landscapes. 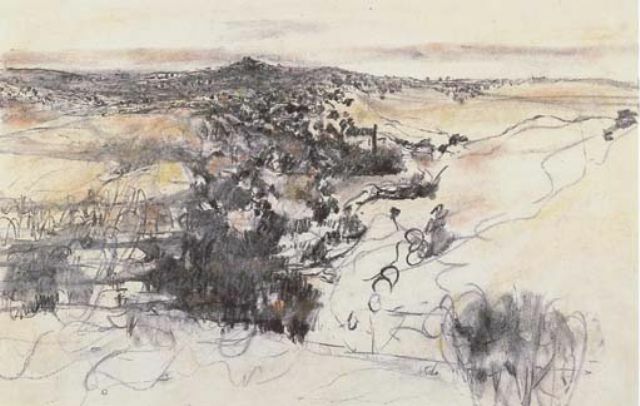 Ticho was struck by the bright Mediterranean light and stark landscapes which she captured beautifully in her etchings, water-color paintings, and drawings of the Jerusalem hills. Her distinctly realist style became extremely popular, and her art is known around the world. Nachum Gutman moved from Romania, then part of the Russian Empire, to Palestine with his family in 1908. He studied art at Bezalel and later throughout Europe. He is known as a pioneer of the distinct Israeli style of painting, drawing away from his European teachers and their traditional aesthetics. Gutman’s personal style was very colorful and figurative, full of symbolism and very reflective of the young, developing Israel of his time. He worked in a wide range of mediums, known also for his large-scale murals and vivid mosaic sculptures as well as his paintings. Menashe Kadishman was an Israeli sculptor and painter most famous for his recurring sheep motif, probably derived from the time he spent working as a shepherd on a Kibbutz in his youth. Kadishman’s famous sheep first debuted at the 1978 Venice Biennale, in which he actually displayed a flock of live sheep that he painted in bright colors. Kadishman remains one of Israel’s most influential artists; his colorful portraits and dramatic metal sculptures are instantly recognizable. Dani Karavan is one of Israel’s best known sculptors, recognizable for his large-scale monuments and memorials. Originally from Tel Aviv, Karavan studied art at Bezalel and later studied traditional fresco painting in Florence and drawing in Paris. His many public commissions range from the Knesset building in Jerusalem to stage sets for the Batsheva Dance Company to Holocaust memorials. Karavan’s sculptures are geometric and bold; often massive, sprawling pieces that interact and connect with the natural environment. Nahum Tevet is a Tel Aviv-based Israeli conceptual artist, well known for his sculptures. He studied art at the Avni Institute of Art and Design and later went on to teach at Bezalel. His sculptures are extremely minimalist, and having worked and studied throughout the 1970s and the 1980s, he was influenced by the conceptual art of the time. He is known as one of the pioneers of Israeli conceptualism and minimalism, yet he still strove to create something new and entirely his own, breaking the rules and taking minimalism to a different level. Adi Nes is a contemporary Israeli photographer, known for his political and controversial series entitled ‘Soldiers’. His photographs explore masculinity and race in Israel and the role the mandatory military service plays in Israeli culture. Nes’s work is often derived from the western art history, mimicking poses and themes from the past, and sometimes even using biblical references and ideas. In one piece, he stages a scene after Leonardo Da Vinci’s The Last Supper, using young Israeli boys and soldiers as models. Nes is renowned both in Israel and abroad for his bold and challenging work and the difficult questions he raises about contemporary Israeli culture.